My sister suggested this recipe, and I tried it later, it is delicious! So let’s see how this blog becomes a family one! 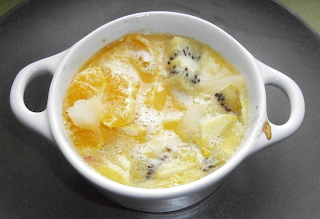 This recipe is ideal if you have various fruits that are going to be lost, and that you want to serve them as a dessert in an elegant way. (You can put the fruits you want! apples, oranges, pears, apricots, cherries … depending on the season and on what you have home). Pre-heat the oven (grill position). Peel and cut the fruits in dices. In a bowl, put the eggs and warm them in a double boiler in a saucepan. Add the sugar and beat until the mixture gets thicker. Stop the fire and add the crème fraîche. Bring together the mixture and the fruits. Place in 5 individual ramekins. Place in the oven and bake for about 5 min. Serve immediately.